1. Drinking Room at Berkeley Springs, W. Va. Drinking Room at Berkeley Springs, W. Va.
2. 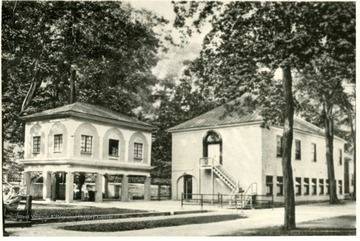 Bath Houses in Berkeley Springs, Morgan County, W. Va.
Bath Houses in Berkeley Springs, Morgan County, W. Va.
Berkeley Springs, W. Va. was officially established as a Health Resort Oct., 1776 by an Act of the Virginia Assembly. George Washington mentioned, when surveying the northern neck for Lord Fairfax in 1748, in his surveying notes the famed Warm Springs. 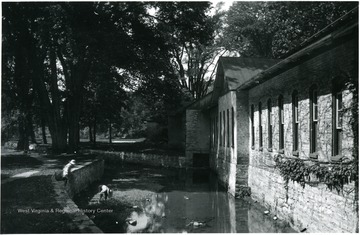 A town site having been made there in 1776. 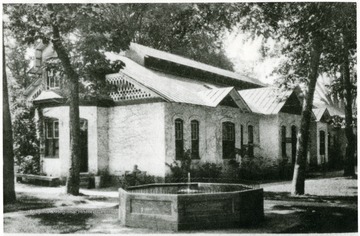 The lots were sold at auction in 1777. Among purchasers were Gen. Washington, Gen. Gates, and other Revolutionary War officers. 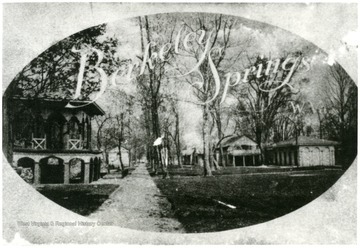 Berkeley Springs' first name was Bath. The Indians used these springs before the white man came. 3. 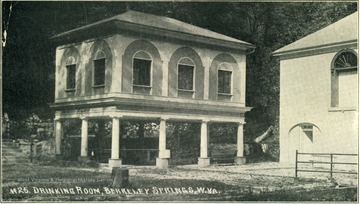 Drinking Room, Spring and Reading Room, Berkeley Springs, Morgan County, W. Va. Drinking Room, Spring and Reading Room, Berkeley Springs, Morgan County, W. Va.
4. Warm Spring Range, Morgan County, W. Va. 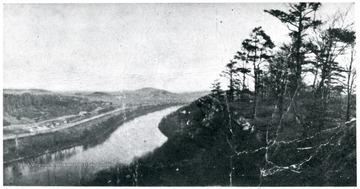 Warm Spring Range, Morgan County, W. Va.
5. 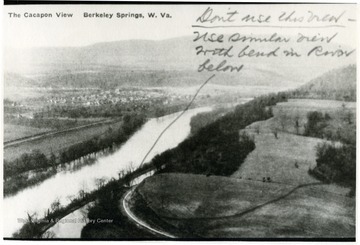 Warm Spring Range, Looking North, Berkeley Springs, Morgan County, W. Va. 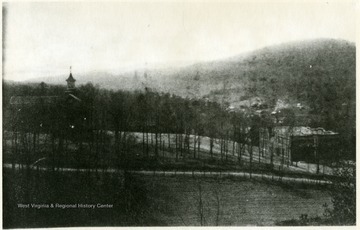 Warm Spring Range, Looking North, Berkeley Springs, Morgan County, W. Va.
6. Fairfax Spring at Berkeley Springs, Morgan County, W. Va.
Fairfax Spring at Berkeley Springs, Morgan County, W. Va.
7. View of Lovers Leap, Near Berkeley Springs, W. Va.
View of Lovers Leap, Near Berkeley Springs, W. Va.
8. 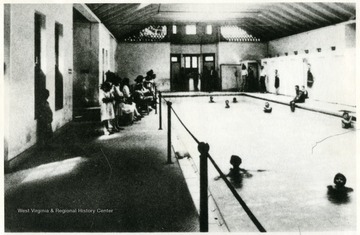 Indoor Swimming Pool, Berkeley Springs, Morgan County, W. Va.
Indoor Swimming Pool, Berkeley Springs, Morgan County, W. Va.
People are swimming in the indoor swimming pool. 9. Bath House, Berkeley Springs, Morgan County, W. Va.
Bath House, Berkeley Springs, Morgan County, W. Va.
10. 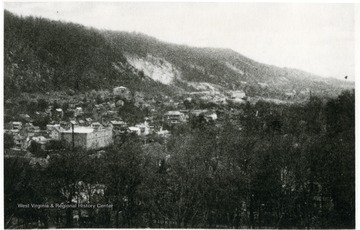 Cacapon View, Berkeley Springs, Morgan County, W. Va.
Cacapon View, Berkeley Springs, Morgan County, W. Va.
11. 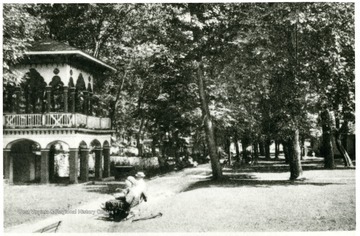 Drinking Room, Spring and Hot Bath at Berkeley Springs, Morgan County, W. Va. 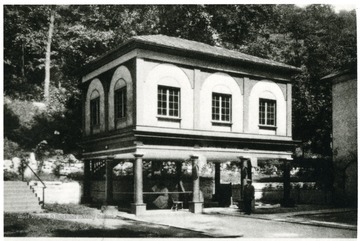 Drinking Room, Spring and Hot Bath at Berkeley Springs, Morgan County, W. Va.
12. Warm Springs Run in the Park at Berkeley Springs, Morgan County, W. Va. Warm Springs Run in the Park at Berkeley Springs, Morgan County, W. Va.